Built as a fishing boat in Denmark in 1958 by Raun Byberg and converted to a yacht in 1993. 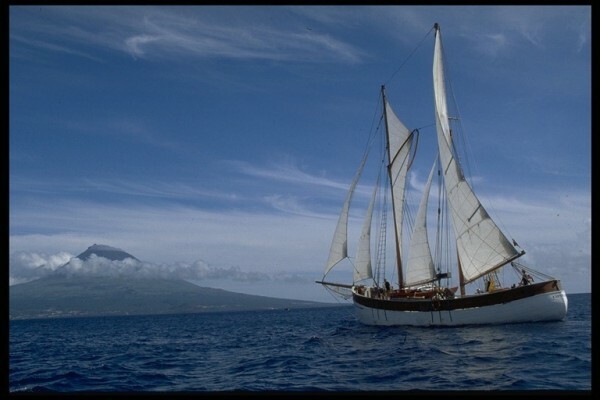 Her deck profile was changed with new hatches and a staysail schooner rig was fitted. She has been in the present ownership for over 20 years now and after many adventures and some wonderful stories, a new owner is required to carry on the exploits. Planked in the traditional Danish way with 2.5” oak planking fastened to 5” x 8” sawn oak frames with galvanised iron boat nails. Frames are fitted in pairs. Grown oak floors with galvanised keel bolts. The original laid deck was replaced in 2006 with 2” marine plywood screw fastened to the oak deck beams and then coated with a 3 component rubber. Hatch coamings are solid oak, finished in white paint with three bronze portholes per side. Coachroof decks of 2” Siberian larch aid on plywood. Deck layout consists of two hatches, one aft of the main mast and one aft of the foremast. Sliding hatch companionways in both hatches give access to the accommodation with a centreline companionway forward of the foremast giving access to the forward areas of the ship. Hydraulic wheel steering at a helm position mounted on the aft hatch. Two mast staysail schooner rig on solid wood keel stepped masts. Bermudan mainsail with varnished wooden slab reefing boom. Mainmast boomed staysail on a varnished wooden boom. Wishbone foremain with a laminated Oregon pine wishbone. Galvanised wire standing rigging parcelled and served in the traditional way with ratlines on the foremast shrouds and starboard side mainmast shrouds. Galvanised turnbuckle rigging screws to external galvanised chainplates. Running backstays on block and tackles. Navigation light boxes mounted in the main shrouds. Pole bowsprit with a single bobstay, whisker stays and a net. Inner forestay to the stemhead, outer forestay to the bowsprit end. Mainsail DK Sails 65sqm 14years Good cond. Rentjes reduction gearbox to 3 blade variable pitch propeller. Gives 6.5 knots cruising at 11lts/hour. 10 knots max at 40lts/hour. Polyethylene fuel tanks, one either side in the engine room with a total capacity of 1000lts. 2 water tanks, one in the engine room and one forward. 600lt stainless tank and a 700lt polyethylene tank. 2 x 220ah 24volt batteries located in the engine room charged from a dedicated engine alternator. 24 volt systems with a 2.5kw inverter. Beneath the main cargo hatch is a large hold, 5m x 5m designed for a variety of cargoes. The main accommodation is forward with a galley right at the for’ard end with the anchor locker in front of this against the stem. The galley has 3 Neptunus gas rings on solid oak surfaces with double stainless steel sinks that gravity drain overboard. Pumped fresh water and salt water to the sinks. Saloon area aft of this with a wood burning stove and a large table offset to port and ample seating around. Two single berths either side under the deckhead. Cargo area aft of this in the centre of the ship with access from the centre hatch. Bunk to starboard under the deckhead. Heads compartment to port with a Jotun sea toilet with direct discharge. Shower with pumped hot water, pumped overboard by an electric waste pump. Access to accommodation in the aft of the ship through the aft hatch. Double cabin in the far stern of the boat with a Reflex diesel cabin heater. Aft heads compartment. Twin cabin between this and the engine space. Access through the whole ship below decks.